How to use the cloud altitude calculator? What is the temperature of clouds? 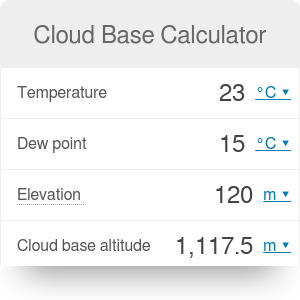 Thanks to this cloud base calculator, you will be able to find what is the temperature of clouds at a day with given weather conditions. You will also be able to accurately assess the cloud altitude - minimum distance from the surface of the Earth at which clouds are likely to form. If you're interested in how the weather conditions change with altitude, check this air pressure at altitude calculator, too! Air temperature: the temperature of air, as measured with a regular thermometer. Dew point: the temperature at which water condensates, measured at the same elevation above sea level as the air temperature. If you are unsure how to measure it, head to our dew point calculator for more details and a quick conversion between humidity levels and dew point. Apart from these two values, you should note down the elevation above sea level at which you took these measurements. By default, our cloud base calculator assumes this elevation to be equal to 0. In this formula, the temperature and dew point are expressed in degrees Fahrenheits and the elevation and cloud base altitude are expressed in feet. Make sure to adjust the result afterwards if you're using the SI units! Where does the formula come from? Let's analyze it in detail. Clouds are formed when water vapor condensates. This, in turn, happens when the air temperature is equal to the dew point, or - in other words - when the spread (difference) between these two values is equal to 0. The rate at which air cools is estimated at 5.4°F per 1000 feet of altitude. The dew point decreases slower - at about 1.0°F per 1000 feet. That means that per 1000 feet, the spread decreases by 4.4°F. If you look at the formula above closely, you will notice that this is exactly how it works: you can use it to determine at what altitude the spread between the dew point and the temperature is equal to zero. At the end, you have to add the elevation of measuring station to obtain the true altitude above sea level. Again, all temperatures are expressed in degrees Fahrenheit and all elevations in feet. How did we arrive at this formula? You already know that temperature decreases by 5.4°F per 1000 feet of altitude. That means that per every 1000 feet of difference between the cloud base altitude and the altitude of your measuring point, the air temperature will decrease by 5.4°F. Cloud Base Calculator can be embedded on your website to enrich the content you wrote and make it easier for your visitors to understand your message.